It is first processed from ﾓGheeﾔ made with Cow's milk. Pure Saffron, and mixed with potent herbs like Jivanti for firming & toning. Lavishes your skin with rich restorative moisture. The base of pure Cow's milk 'Ghee' instantly provides extraordinary lighting of the skin tone and brightening of the skin. With regular massage the skin acquires a noticeably soft, fairer, resilient and 'plumped' quality, and a radiant glow or ﾓTejasﾔ. This rejuvenating facial massage cream is specially formulated from the ancient Tejasvi formulation in Vedic texts to lighten and brighten the skin. 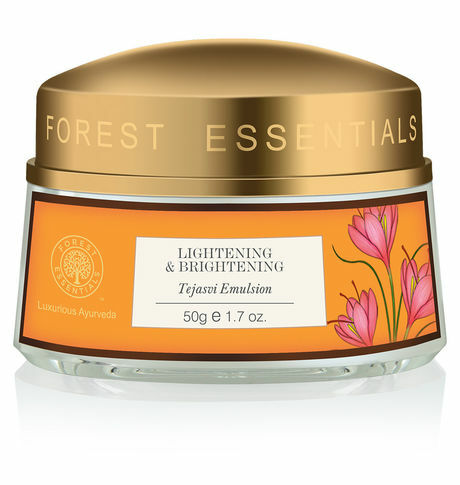 This unique Emulsion removes blemishes and pigmentation by combining the potent properties of age-old Ayurvedic herbs, pure whole cream cow's ghee, sweet Almond oil, virgin Coconut oil and Kokum butter blended with purifying and skin lightening and brightening herbs, root and flower extracts, leaving your skin supple and radiant. This extraordinary productﾠtakes many months to prepare, as it is first processed from ﾓGheeﾔ made with Cow's milk. Cow's milk is much finer and lighter in texture than the more creamyﾠBuffalo milk, and requires much more milk to make a small amount of Ghee. -This Ghee is then ﾓagedﾔ according to Ayurvedic texts, with pure Saffron, and mixed with potent herbs like Jivanti for firming & toning, Manjistha for refining skin texture, Cluster Fig for clarity and Kasturi Manjal for smoothness and elasticity. This is mixed into earthenware pots and buried beneath Banyan trees for about 2 months. It is then cooked on a slow fire with the addition of some fresh Cow's milk, virgin Coconut oil and fresh Rose petals.